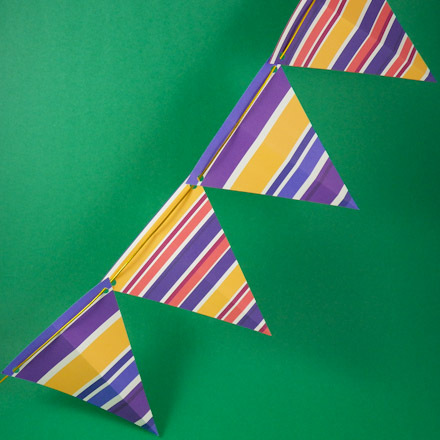 In this project, you will make colorful pennant flags, then string them together to make a banner for Easter. 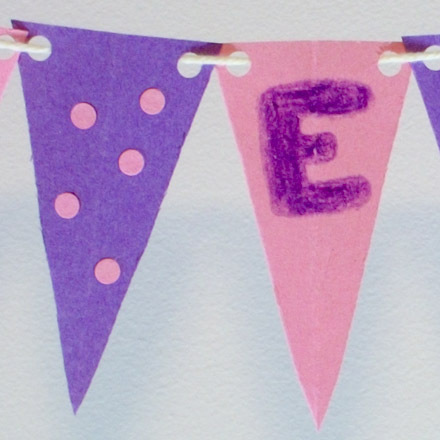 Use these banners to decorate your home or the classroom. 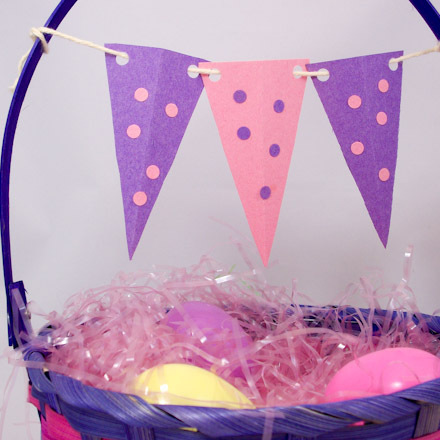 The pennant flags can also be tied to an Easter basket as tags. Making pennant flag banners requires no patterns and uses simple materials. It is great for families or groups, and with a little preparation by the adults or teen leaders, this project is fast and fun. Related project: See the Valentine Flag Banner craft project for another easy way to make pennants. Select paper colors and pre-cut paper blanks. The blanks for pennant flags need to be approximately 4" by 9" for smaller flags, or 6" by 9" for larger flags (10cm by 23cm, or 15cm by 23cm). The smaller blank makes 7 flags, while the larger blank makes 3 flags. For best results, the blanks need to have straight sides and square corners. The sizes can vary a bit. If you want larger or smaller flags, just keep similar proportions. Tip: For younger children, you may want to complete the cutting of the flags and have them help with decorating and stringing. The pennant flag banners can have from 3 flags to 14 flags. For a banner that reads HAPPY EASTER, you will need 11 to 14 flags. For the smaller flags, fold a flag blank in eighths accordion-style. To do this, first fold the blank in half, matching the short ends, then in half again and in half again. Unfold and refold back and forth accordion-style. For the larger flags, fold the blank in fourths accordion-style. Neatness counts! Cut on a diagonal from one corner to the other. You may want to use a ruler to draw a line before cutting. Unfold the pennant flags. You should have either 7 small flags or 3 larger flags and two half-flags. Punch two holes at the top of each flag—one in each corner. To make a banner that reads HAPPY EASTER, layout at least 11 flags—one for each letter. You can add 3 additional flags for decoration—one at the front, one between the words and one at the end. Alternating colors of pennant flags look very nice. Color a block letter on each flag, spelling out HAPPY EASTER. Stenciled letters look very nice, or just draw the letters by hand, making very thick lines. If you like, decorate the reverse sides of the flags and any extra flags you have added to the banner. Gluing the punched holes on the flags is a great way to go! Tip: Crayons work best with construction paper flags. Markers have a tendency to bleed through to the opposite side. Cut a length of yarn long enough for the number of flags and where it will be hung—usually 4 to 6 feet (1 to 2 meters.) Weave the yarn through the punched holes on the flags. Tip: Children may need help here. A blunt yarn needle can make the job go faster. Hang the banner using tape, tacks or whatever is appropriate for the surface being decorated with the banner. That's it! Stand back and enjoy your creation. Tip: The small pennant flags can be hung from the handle of an Easter basket. Tip: The pennants can be made from patterned paper. Print one of Aunt Annie's ePapers, like these Golden and Plum Stripes, on letter-size paper. Trim the paper to about 4 by 8½" or 6 by 8½", then fold and cut according to the instructions. 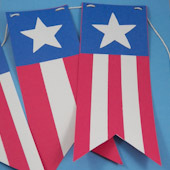 Related project: For red, white and blue decorating, make a Stars and Stripes Pennant Banner.